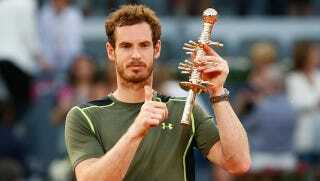 Andy Murray breezed past Rafael Nadal 6-3, 6-2 to win the Madrid Open on Sunday. The win is Murray’s first Masters win on clay, as well as his first win over Nadal on the surface. Murray handled Nadal fairly easily. He broke the Spaniard twice in the second set, racing out to a 4-0 lead before clinching at 6-2. It’s likely Murray’s best performance on clay, and it comes nine days ahead of the French Open. Novak Djokovic will likely be the favorite at Roland Garros, but Murray at the very least looks capable of putting up a fight. Nadal, whose initial rise to stardom started with his dominance on clay, has now lost four matches on the surface so far this year. Nadal had not lost a set in Madrid until his match with Murray, but the defeat casts doubt on his chances of claiming a 10th French Open title.